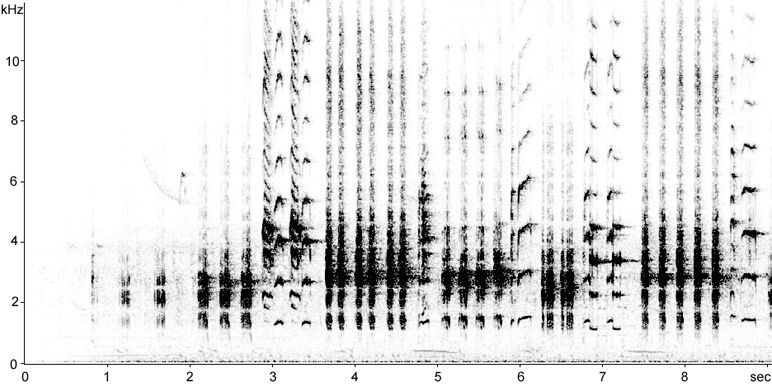 Territorial song from Phragmites reedbed - crunchy low pitched syllables followed by higher pitched squeaky syllables (sonogram shows initial nine seconds of a much longer recording). Singing from lake edge of Phragmites, Typha, and Salix. Song composed of a semi-continuous output of stropes up to 10 seconds, each comprising alternating phrases of 4-6 harsh, grating elements and squeaky higher-frequency elements at a steady tempo. Territorial song delivered from bankside vegetation around the fish ponds; harsh, crunchy phrases alternating with high-pitched squeaky notes. 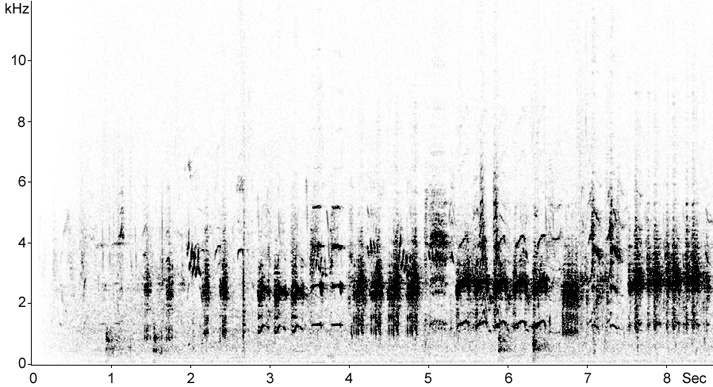 Territorial song (not full song) from within Phragmites reedbed - crunchy low pitched syllables followed by higher pitched squeaky syllables (higher pitched Reed Warbler in the background).